by The Lazy Dog Cookie Co. It was hard to believe that our little puppy was turning one year old already. We wanted his first birthday to be extra special, but this proves to be quite difficult when you are on the road. There are definite advantages and disadvantages to being born on the day after Christmas. Needless to say, it was a busy week for all of us. I had all of these wonderful ideas of baking him a special cake, wrapping presents for him, taking him to the park for playtime; the whole shebang. We made sure on Christmas that he didn’t miss out on unwrapping toys, but we had to come up with a more practical way of celebrating his birthday since we weren’t at home. Getting a special treat and singing "Happy Birthday" was just about all we (Balki included) had energy for. I was surprised to find out that the pet store has little to offer when it comes to dog birthday items. The only thing we could find was a birthday pie. Fortunately, it worked out great. The Original Pup-PIE is made by The Lazy Dog Cookie Co. 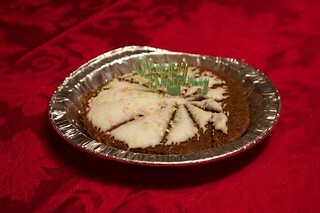 It comes in a mini pie tin and is decorated with colorful frosting and a little "Happy Birthday" sign. I’m sure that we would have paid more, given that we didn’t have any other options, but it was actually very reasonably priced at around seven dollars. What’s more, it’s wheat and corn free, organic, and handmade in the USA. The more I looked at the packaging, the more I loved about this product and the company that makes it. The box it comes in is made out of recycled paperboard AND printed with vegetable ink! Balki loved his birthday surprise and it was large enough to share with his buddies.